Bingley Five Rise Locks01274 433678work Industrial HeritageBingley Five Rise Lock staircase, the steepest lock staircase in Britain, is the most spectacular feature of the Leeds and Liverpool canal. It is situated about half a mile north of Bingley Railway Station, about 17 miles north west of Leeds and 12 miles south east of Skipton. The locks open directly from one to another, with the top gate of one forming the bottom gate for the next. The Bingley Five Rise Lock was opened in 1774 and has a total fall of 60 feet. 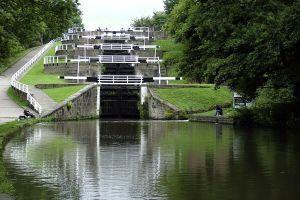 The locks are a Grade 1 listed structure and have been awarded a Red Wheel plaque by the Transport Trust. Bingley Five Rise Lock staircase, the steepest lock staircase in Britain, is the most spectacular feature of the Leeds and Liverpool canal. It is situated about half a mile north of Bingley Railway Station, about 17 miles north west of Leeds and 12 miles south east of Skipton. Amenites are all to be found in the cafe which is situated at the top of the locks. The Locks are located just off Beck Lane, just outside the centre of Bingley. Brown signs indicate the route. Street parking is available.